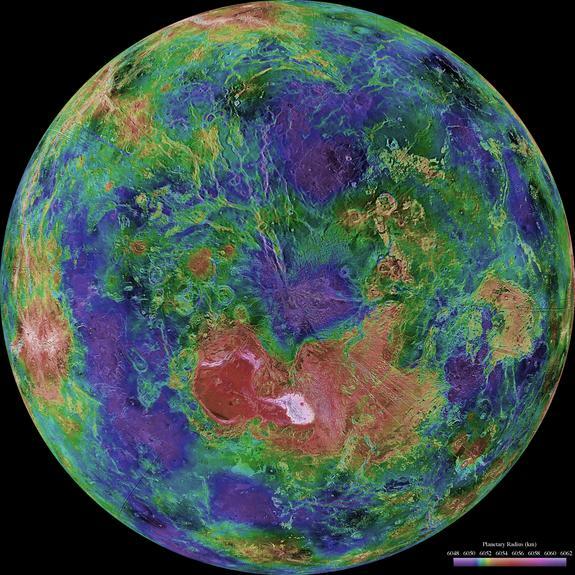 Credit: NASA/JPL/USGSThis hemispheric view of Venus was created using more than a decade of radar investigations culminating in the 1990-1994 Magellan mission, and is centered on the planet's North Pole. The Magellan spacecraft imaged more than 98 percent of Venus and a mosaic of the Magellan images forms the image base. Gaps in the Magellan coverage were filled with images from the Earth-based Arecibo radar in a region centered roughly on 0 degree latitude and longitude, and with a neutral tone elsewhere (primarily near the South Pole). This composite image is color-coded to show elevation.